The citation reads…”The incongruity of a major international opera house in a small Irish town is reflected in the boldness of Keith Williams’s design. The building itself, like its predecessor, is almost invisible from the surrounding streets, and even the unassuming entrance is a replica of what previously existed: a modest entrance foyer in a small domestic-scale street. From there however the building unfolds into an atrium space that links all three levels of the auditorium. 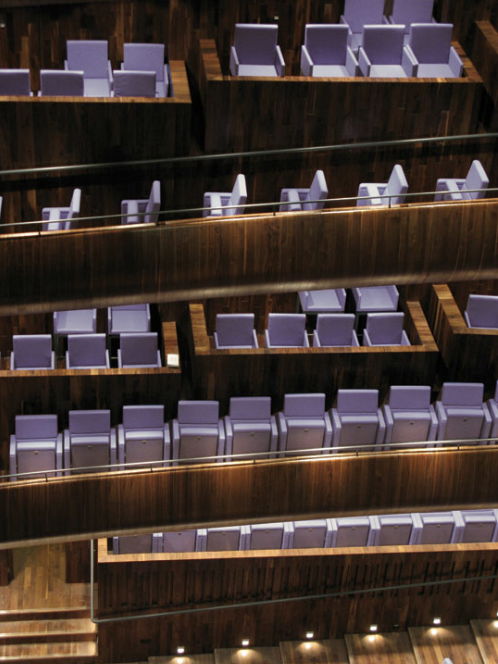 This is a place for the audience to promenade, for people to see and to be seen, as they ascend an elegant walnut staircase that introduces the language of the auditorium itself. Ascend the last flight of stairs and you emerge in a restaurant that has extraordinary views not only over the town but the distant landscape and harbour beyond. At last you see where you are.